As a reading list user who wants to conserve data usage, I want to be able to stop downloading synced articles to my device when so that I do not waste mobile data. 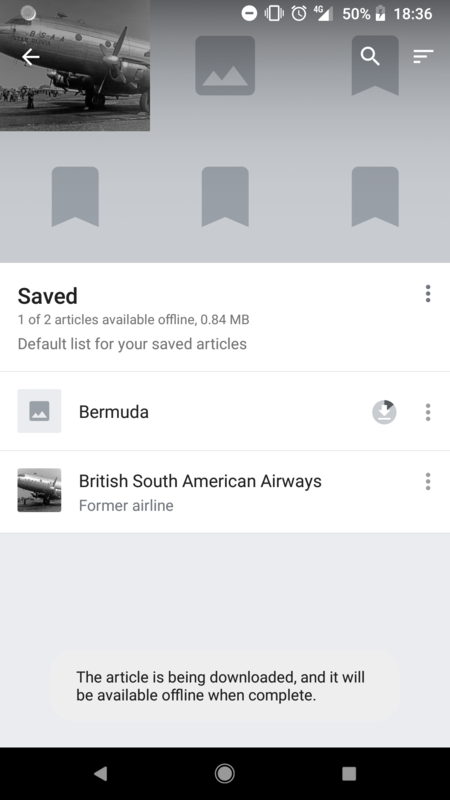 Add a setting to the "Data usage" section of the app which enables users to "Download only over Wi-Fi". Go to any article and save to a reading list. It is *expected* the article will not be downloaded since WiFi is unavailable. Turn WiFi on. It is *expected* the article will be download since WiFi is turned back on. Go to the reading list where the article was saved. Tap on the "downloading in progress" icon for that article. 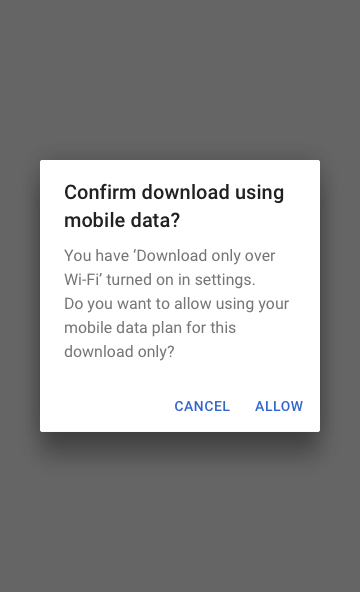 It is *expected* a dialog will appear asking if the user wants to proceed with downloading using mobile data. If user selects 'yes', the article will be downloaded with mobile data. RHo added a parent task: T163596: [EPIC] Provide users with more bandwidth usage control. LGoto edited projects, added Wikipedia-Android-App-Backlog ( Android-app-release-v2.7.25x-J-Jaffa-Cake); removed Wikipedia-Android-App-Backlog. cooltey moved this task from Backlog to Doing on the Wikipedia-Android-App-Backlog ( Android-app-release-v2.7.25x-J-Jaffa-Cake) board. 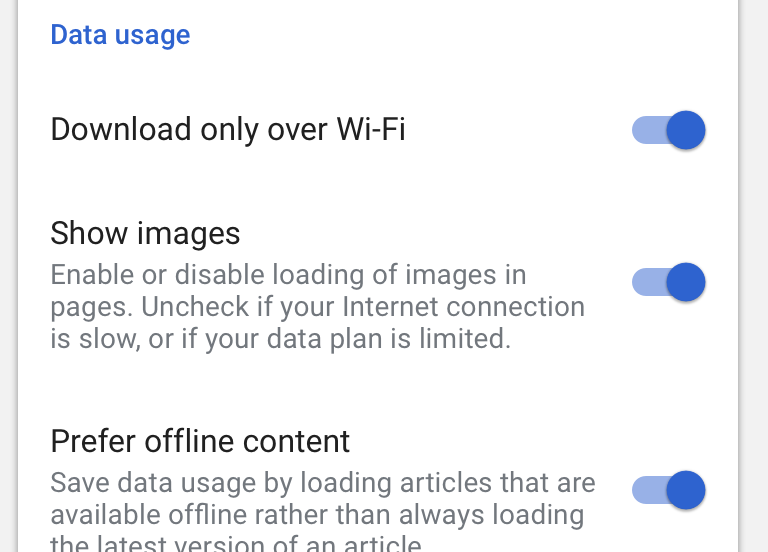 Does this "Data usage" section has any description text for it? (note I updated the verbiage though to "Download only over Wi-Fi"
You can register a BroadcastReceiver for the app for notification of the wifi state, to automatically resume download when you are back on wifi. just a thought. @TheDJ That's good! Thanks for sharing your idea. When the state of Download only over Wi-Fi is ON, which icon should the app show to users? The downloading in progress icon? or the available to download icon on each article? 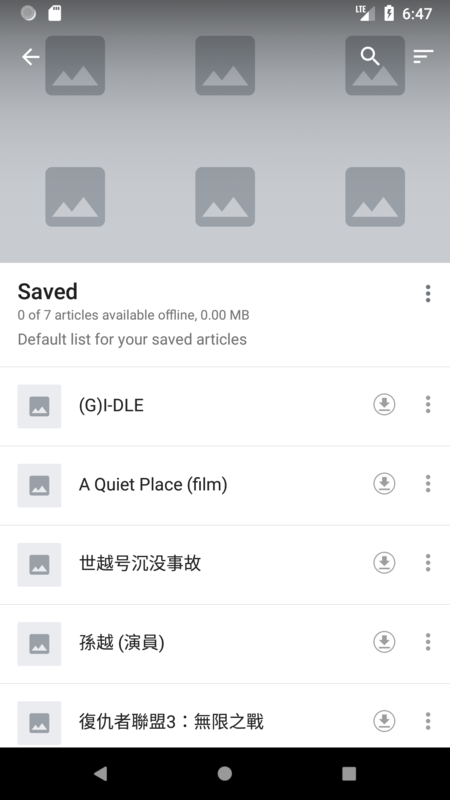 When the state of Download only over Wi-Fi is ON, should it be available for users to do the download the article action manually by clicking on the download icon or save all for offline? When the state of `Download only over Wi-Fi` is ON, which icon should the app show to users? hi @cooltey - the expectation is that the download will resume when the user is on Wi-Fi, so let's keep it as the downloading in progress icon. Thanks! 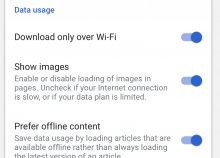 When the state of `Download only over Wi-Fi` is ON, should it be available for users to do the  download the article action manually by clicking on the `download icon ` or `save all for offline`? @RHo Thanks, yes we can show dialogs to users. [apps/android/wikipedia@master] Follow-up to Wi-Fi download setting. • Vvjjkkii removed cooltey as the assignee of this task. • Vvjjkkii edited subscribers, added: cooltey; removed: gerritbot, Aklapper. Sharvaniharan assigned this task to cooltey. Sharvaniharan lowered the priority of this task from High to Normal. Sharvaniharan set the point value for this task to 2. Sharvaniharan removed projects: TCB-Team, Mail, New-Editor-Experiences, Language-2018-Apr-June, KartoEditor, Jade, Hashtags, Gamepress, Tamil-Sites, Connected-Open-Heritage-Batch-uploads (RAÄ-KMB_1_2017-02), CheckUser. Sharvaniharan added subscribers: Aklapper, gerritbot. Hi @cooltey – the setting works but I'm not seeing the dialog to allow mobile data downloading as detailed in scenario B (see updated task description). incorrect toast message saying that the article download is in progress. The dialog shows when the status of the article is not in "OFFLINE". We'll need to do Remove from offline and then try to click the download icon again to trigger the alert dialog of using mobile data. I will add another logic that if the download is processing and click on the downloading icon will do the forced download.